As part of an effort–started months ago, so you can guess about the rate of success [or relative lack thereof]–to make our basement more livable for a family of four, I spent some time this past weekend sorting through some of the old boxes I brought over when we moved in to our home five years ago. 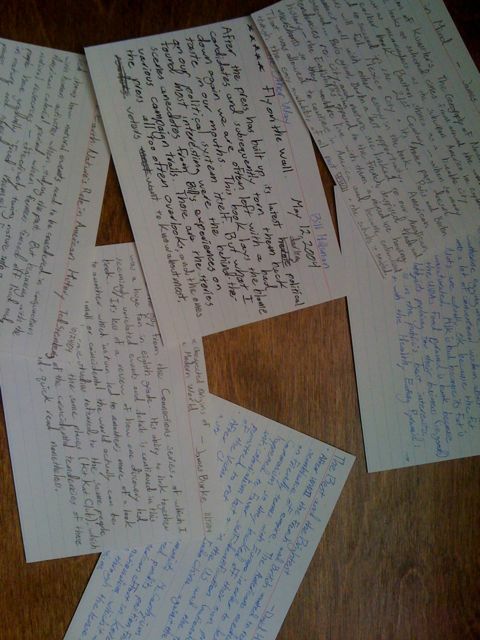 In the process I scrounged up these oversized index cards. Book report cards. From 2004. I wasn’t in college anymore. And there were no book clubs involved. These were merely the result of a little, personal project I was doing. An attempt to not forget key points from the books I was enjoying. Because you never knew when you’d need to be reminded. I’ll be posting a few of the book reports in coming days. The cards have to go, but some of the points might be worth remembering.